In July 1968, the Yardbirds finally threw in the towel. Relf and McCarty made the fatal decision that heavy, guitar dominated music was on the way out. They formed the art rock/progressive band, Renaissance. McCarty is still rueful, yet bemused, about the path he chose to follow. He has since reformed the Yardbirds several times. The latest configuration, with Chris Dreja, has toured America and Europe well into the New Millenium. They do an incredible version of "Dazed and Confused,” seguing straight from a note perfect "Still I'm Sad.” It would seem that McCarty and Dreja feel some right to the song. Relf and McCarty's foray into prog rock was short lived. They released only one album with Renaissance. A second Renaissance LP was half done before they packed it in and John Hawken took it upon himself to locate other musicians to finish it. Keith Relf apparently realized the error of his ways, forming a heavy metal band in the mid-70s. Their one and only album, the self-titled Armageddon, is one of the great lost classics. It easily stands cheek by jowl with his former bandmate's work in Led Zeppelin. Chris Dreja was initially slated to be the bass player in Page's new lineup, but bowed out gracefully once a more enthusiastic replacement was found. Page obviously made the right choice. He walked away with a stockpile of songs, including heavy metal's nascent anthem, "Dazed and Confused." The stalwart Jimmy Page soon assembled a new band, which still called itself the Yardbirds. Comprised of Page, fellow session hack John Paul Jones on bass, drummer John Bonham and vocalist Robert Plant, they fulfilled the original band's final contractual obligations, touring Sweden in September 1968. Contrary to accepted facts, the band was not known as the New Yardbirds at the time. Scandinavian ads billed them as either the Yardbirds or Yardbirds with Jimmy Page. Now back to the name "Yardbirds” itself. McCarty and Relf signed a document, which authorized Page and Dreja to fill out a Yardbirds group to satisfy the Scandinavian dates only. Page and Dreja had the name, even when Dreja left the band to pursue his passion for photography. Chris Dreja cleared up matters in a 2001 interview with this author. He recalled an exchange with the last Yardbirds manager, Peter Grant, who would go on to guide Led Zeppelin as well. "I do remember through my own lawyer just remind Peter that I had in no way given up moral rights to the name itself whether I was a photographer or dentist or whatever. I certainly didn't hand it over to Jimmy Page," Dreja said. "I wasn't going to give up the moral rights to my status and what the band was. And through my lawyer I informed them of that. It was nothing heavy, but it's interesting they became Led Zeppelin fairly quickly." When Chris Dreja found out that manager Peter Grant was sending the group out to tour England (October 18-19) under the name, the ex-Yardbird informed Page and Grant that he did not want them to use said name. The name change was announced in the October 19, 1968 issue of "Disc" magazine. Dreja's request caused the name change - Page has never owned it. Around this time, the new group had entered the studio to record their first album (boxes containing the master tapes are marked "Yardbirds"). Soon, they adopted their new name, which would grace their eponymous debut. Amusingly enough, the name Led Zeppelin itself wasn't devised by any member of the band. In May 1966, Jeff Beck was growing disenchanted with the Yardbirds. He and Jimmy Page entered the studio to record a number of tracks along with John Paul Jones and the Who's great drummer, Keith Moon. Moon's bandmate, John Entwistle, was also involved in some capacity. Apocryphal legend says the recording session went so well that the four musicians discussed forming a band. Moon and Entwistle were dissatisfied with Pete Townshend's increasing dictatorial grip on the Who. They were quite keen on the idea as were Page and Beck. They bantered back and forth over what would be a fitting epithet for the band. Someone said they would "go over like a lead balloon." Entwistle's rejoinder was to the affect that the band should be called "lead zeppelin." Moon brayed with delight. Page filed the name away in that steel trap that serves as a brain. One of the songs recorded at this session, "Beck's Bolero," figures into the scheme of things at a later point. Exhilirated by the experience, Page realized the unit would need a dynamic vocalist. One of those approached was the Small Face's diminutive, yet powerful singer, Steve Marriott. Page was quickly rebuffed by the Small Faces' management, which had shady underworld connections. Jimmy Page was asked if he could "play guitar with broken fingers" or words to that affect. Needless to say, Page never contacted Marriott. Marriott's work with the Small Faces would figure into the Led Zeppelin saga, though. Page returned to the Yardbirds until the summer of 1968. As already documented, he formed a new unit, which became known as Led Zeppelin. Once the tour of Scandinavia was over, the band entered the studio to record their first LP in the fall of 1968. Led Zeppelin's self-titled debut was recorded in under thirty hours. And it shows in the lack of originality. Jeff Beck in the meantime had formed his first solo band. The Jeff Beck Group took the Yardbirds' formula to its logical conclusion, i.e. loud and hard psychedelic blues mutating into what we now call heavy metal. This crackerjack unit was comprised of Beck on lead guitar, Steampacket's Rod Stewart on vocals, Birds' guitarist Ron Wood on bass and Mick Waller on drums. They recorded the very first heavy metal album, "Truth." Released in August 1968, Jimmy Page was to use his ex-bandmate's album as a veritable blueprint for Led Zeppelin's debut. A track by track comparison of "Truth" and "Led Zeppelin I" is an intriguing process. Both albums had a reworking of a Yardbirds' song. The Beck album opened with a roaring, albeit less effective, version of "Shapes of Things." Led Zeppelin also used a Yardbirds' song, "Dazed and Confused." Page at this point rewrote the lyrics yet again, but he stuck strictly to the arrangement he and Yardbirds drummer Jim McCarty devised. The Led Zeppelin version is solely credited to Jimmy Page, with no mention being made of Jake Holmes. In 2001, this author asked Holmes when he became aware of Led Zeppelin's version. "When the album came out! And then, stupidly, I never followed up on it," Jake Holmes said. "In the early 1980's, I did write them a letter and I said basically: 'I understand it's a collaborative effort, but I think you should give me credit at least and some remuneration.' But they never contacted me." Holmes shared this writer's assessment of the Yardbirds proto-psychedelic version as oppossed to Zeppelin's bombastic numbskullery. Previous to 2001, Holmes had been unaware that the Yardbirds even covered it until receiving a copy of their Anderson Theatre performance. "The Yardbirds' 'Dazed & Confused' is really good. I understand what 'garage' people see in all this craziness. I like their version much better than Led Zeppelin's," Holmes said. Be that as it may, it still doesn't address Page's motivation in lifting the song and then denying credit to Holmes. In a 1990 interview with Musician magazine, Jimmy Page quickly soured when questions veered into this territory. The Q and A exchange is quoted below. Musician: I understand "Dazed & Confused" was originally a song by Jake Holmes. Is that true? Page: [Sourly] I don't know. I don't know. [Inhaling] I don't know about all that. Page: Well, I did that with the Yardbirds originally... 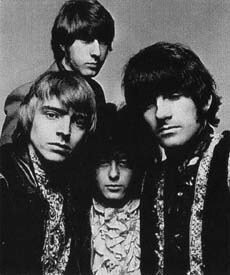 The Yardbirds were such a good band for a guitarist to play in that I came up with a lot of riffs and ideas out of that, and I employed quite a lot of those in the early Zeppelin stuff. Page: Hmm. Well, I don't know. I don't know about that. I'd rather not get into it because I don't know all the circumstances. What's he got, The riff or whatever? Because Robert wrote some of the lyrics for that on the album. But he was only listening to... we extended it from the one that we were playing with the Yardbirds. Page: No, I think we played it 'round a sort of melody line or something that Keith [Relf] had. So I don't know. I haven't heard Jake Holmes so I don't know what it's all about anyway. Usually my riffs are pretty damn original. [laughs] What can I say? Yardbird Chris Dreja provided his take on the matter - and probably the most insight - when this author asked him to muse on Page's 40-year denial. "It's the guilt," he said simply. Both albums (Truth and Led Zeppelin I) also contained a traditional English folk song. Beck's LP had a lovely acoustic arrangement of "Greensleeves." He didn't take any credit for the song. Page, on the other hand, showcased his companion piece to "White Summer." The song was called "Black Mountainside." It is credited solely to Page, yet humorously enough it is a centuries old tune. He probably picked it up from Bert Jansch, who is one of Page's primary acoustic influences. Further, Jansch had been playing the song for years, using its original title "Black Waterside." He never took credit for the song. Jimmy Page, however, boldly stamped his name on the tune. As a side note, Davey Graham probably devised the D-A-D-G-A-D tuning used on "Black Waterside" and on "White Summer." Annie Briggs, another influence on Page, was also known to do a version of "Black Waterside." "The accompaniment was nicked by a well-known member of one of the most famous rock bands, who used it, unchanged, on one of their records," Jansch was quoted as saying in Doug Kennedy's 1983 "The Songs and Guitar Solos of Bert Jansch. " This contrasting of heavy songs with light acoustic numbers was to become Led Zeppelin's trademark. Yet the Jeff Beck Group did it first and to better affect. Beck is as dazzling a guitar player as Jimmy Page, yet he is far more precise and capable of restraint. Interestingly, Jeff Beck's solo debut contained a rock 'n roll interpretation of Ravel's "Bolero." Entitled "Beck's Bolero," the piece came from the aborted 1966 supergroup session that had found Beck, Page, John Paul Jones and Keith Moon collaborating. Page provided some propulsive acoustic rhythm work upon which Jeff Beck overlaid stinging lead guitar. The song is once again credited only to Jimmy Page. Beck and Page have feuded over the songwriting rights in numerous interviews. To this day, Beck insists he came up with the arrangement. After all, it wasn't called "Page's Bolero." "Keith Relf had a melody on tape and we used that as the main part of the song. I don't think that Beck actually came in on the backing tracks - he just did the overdubs and wrote the central section - the riffy bridge," Page said. It is left up to you, gentle reader, to make up your own mind as to where the origins of this song truly lie. Truth also contained a version of the Muddy Waters classic, "You Shook Me." For some reason, Page also decided to include this song on Led Zeppelin's first album. While the song is properly accredited to its author, Willie Dixon, Jeff Beck was less than enthusiastic upon hearing Led Zeppelin's demo. With Truth still on the charts, he was unable to understand Page's decision to record the song for Led Zeppelin I. As recounted in the Led Zeppelin biography, Hammer of the Gods, Beck's eyes teared with rage as he demanded, "Jim, why?" Page just shrugged sheepishly, unable to explain why he wanted to upstage his former bandmate. A hamfisted rewrite of Eddie Cochran's rockabilly classic "Nervous Breakdown" appeared on Led Zeppelin's first album. Entitled "Communication Breakdown," this interpretation made no mention of Cochran, being credited to Bonham/Jones/Page. Annie Briggs' fingerprints were all over another song on Led Zeppelin I. Her original, "Babe, I'm Gonna Leave You," was appropriated by the foursome with the credits reading Bredon (her real name)/Page/Plant. Whether Page and Plant added anything to the song is debatable. Led Zeppelin I closed with the ultimate pastiche. "How Many More Times" opens with a bass riff that came straight from the Yardbirds' reworking of "Smokestack Lightning." Lyrically it is comprised of Howlin' Wolf's "How Many More Years," Albert King's "The Hunter" and bits of Gary Farr and the T-Bones' "How Many More Times." Further, there was a direct quote of Jimmy Rodgers' pop hit, "Kisses Sweeter Than Wine." A listen to the Yardbirds Last Rave-up in L.A. bootleg reveals an interesting fact. "Smokestack Lightning" has the bolero section from "Beck's Bolero." Page also used this on "How Many More Times.” The only thing original about the song is Page's violin bowing. "How Many More Times" is credited to Bonham/Jones/Page, though. During 1969, Led Zeppelin toured continually. They recorded their sophomore effort in various studios while they were on the road. The resulting album is uneven and shows less originality than its predecessor. "Whole Lotta Love" opens Led Zeppelin II. As mentioned earlier, Steve Marriott and the Small Faces figure into the Led Zeppelin saga. That mod foursome were known for a killer live version of the Muddy Waters "You Need Love." The following paragraph is from Small Faces: The Young Mods' Forgotten Story by Paolo Hewitt (1995, Acid Jazz Books). "Whole Lotta Love" is obviously, as Steve Marriott pointed, a direct nick of the Small Faces take on "You Need Love." The lyrics are basically the same as the Muddy Waters version. Further, Robert Plant's vocal stylings are indeed modeled directly on Marriott's delivery. One listen to the Small Faces version will lay any doubt aside. Unfortunately, the Small Faces songwriting credits made no mention of Willie Dixon. Of course, neither did Led Zeppelin. Interestingly enough, Willie Dixon's own daughter, Shirley, brought it to her father's attention. As reported in the October 8, 1994's edition of The Los Angeles Times by Steve Hochman, Shirley Dixon first heard Led Zeppelin's version when she was thirteen. She played it for her father, who agreed it was his song. Willie Dixon was receiving no royalties from it. In 1985, Dixon sued Led Zeppelin for royalties to "Whole Lotta Love." The case was settled out of court two years later, with a generous settlement to Willie Dixon. Today, Shirley Dixon heads the Blues Heaven Foundation (established by her father), which helps blues artists recover their royalties and rights. Another blues classic on Led Zeppelin II became famous as "The Lemon Song." Derived directly from Howlin' Wolf's "Killing Floor," there is also the infamous quote about squeezing lemons that comes from Robert Johnson's "Traveling Riverside Blues." Chester Burnett, a.k.a. Howlin' Wolf, received no credit for "The Lemon Song." In the early '70s, Arc Music sued Led Zeppelin for copyright infringement. The suit was settled out of court. The album closed with a song credited to Page/Plant, "Bring It On Home." Discerning listeners realized it was the old Sonny Boy Williamson song of the same name, albeit with a furious Page solo. Once again, the song's author, Willie Dixon, won a settlement. Led Zeppelin III found Page still rummaging through his suitcase of Yardbirds castoffs. An album track, "Tangerine," was one Page had worked on with the Yardbirds in the spring of 1968. At that time, it was called "Knowing That I'm Losing You." The two arrangemens are identical. The Yardbirds had never copyrighted the piece, which made it easy for Page to usurp it in its entirety. The song was attributed solely to Jimmy Page with no mention being made of Keith Relf, who had written a significant chunk of the lyrics that appeared in Led Zeppelin's version. "He [Keith Relf] should really be given a credit for that one," Jim McCarty said, referring specifically to the second verse's lyrics in "Knowing That I'm Losing You," which appear intact as the first verse in "Tangerine." This author conducted interviews with McCarty, Dreja and Keith Relf's sister, Jane, in the autumn of 2001 for a story on the Page era Yardbirds, which appeared in the 2002 edition of Ugly Things magazine. Lest readers think plagiarism is a victimless crime, Jane Relf's reaction to information on the "Knowing That I'm Losing You" and "Tangerine" situation should give cause for pause. "My brother plucked that session man out of obscurity and gave him a job and that's how he repaid him?" Jane Relf mused. "My brother was not well-off at the end of his life and the royalties for that song could have helped out considerably." She was refering to Keith Relf's financial straits at the time of his death in 1976. As for "Knowing That I'm Losing You" and "Tangerine." both feature a steel guitar courtesy of Page. Once again, the Yardbirds' unreleased version is superior. Relf's vocals are heartbreaking and McCarty's drums much lighter and better suited to the song's fragility. Their take has a prominent Morricone touch and the massed vocals at the end take it to new heights. Led Zeppelin's version simply pales in comparison. Page, though, had the good sense to realize the song's appeal and it has since gone onto be one of Zeppelin's most beloved songs, free as it is of Plant's insipid cliches that pass themselves off as lyrics. Page claimed authorship of the entire song, including the lyrics. The Yardbirds had never copyrighted the piece, which made it easy for Page to usurp it in its entirety. The flower-child verses smack of Keith Relf, though. Another track from Led Zeppelin III, "Since I've Been Loving You," lifted significant lyrical passages from Moby Grape's "Never." In doing so, Robert Plant can't really be accused so much of plagiarism as sheer laziness. Both tracks are meandering and desultory nonentities. Why in the world would Plant use verses that Moby Grape member Bob Mosely was obviously making up on the fly? Most likely, it was meant as an homage, considering Plant's love of West Coast hippy bands. Both songs are generic blues jams and Plant would have been better served by devising new lyrics. This would come back to haunt him. In 2005, according to an anonymous source, Led Zeppelin came to a financial agreement with Mosely although he will never be acknowledged in the credits of "Since I've Been Loving You" as part of the arrangement. "Bron-Y-Aur Stomp" is basically an original song with Jones/Page/Plant being listed as the song's authors. However, the intro is lifted from "The Waggoner's Tale" by Bert Jansch. Nineteen-seventy-one's Led Zeppelin IV, showed the band to be up to their old tricks. The drum intro to "Rock 'n Roll" was a direct lift from Little Richard's "Keep A-Knocking." One listen to that early nugget will prove the point. Further, elements of the solo from the old Yardbirds warhorse "Train Kept A-Rollin" show up in "Rock 'n Roll." But it is that holiest of Holy Grails, "Stariway To Heaven," that will shock the faithful. On one of Led Zeppelin's early tours, they had opened for the California art-rock group, Spirit. In the liner notes to the reissue of Spirit's 1968 eponymous debut, the band's guitarist Randy California mentions the fact that Jimmy Page took special interest in an original entitled "Taurus." There is no doubt that Page appropriated the opening guitar lines note for note on "Stairway To Heaven." Further, the chord progression in "Stairway To Heaven" is incredibly similiar to a song by the Chocolate Watch Band, "And She's Lonely." The Yardbirds played with the Chocolate Watch Band during Page's tenure. It would be quite ironic if he did indeed lift the chords from the Chocolate Watch Band. The Chocolate Watch Band, to those in the know, were the ultimate Yardbirds clone. Wouldn't it be fitting that a former Yardbirds guitarist ripped off something from a band that based an entire career around sounding like that famed quintet? Led Zeppelin IV found the band tackling a Memphis Minnie original, "When The Levee Breaks." In this case, Memphis Minnie is credited, but so are the four members of Led Zeppelin. What they contributed to the song - besides a sluggish beat - is once again debatable. Led Zeppelin continued to appropriate songs throughout the rest of their career, albeit with less frequency. For the most part, the songs examined in this article are the most notorious cases of Led Zeppelin lifting others artistic works. Is this hair-splitting? Isn't rock 'n' roll all about taking influences, warping and twisting them until they come out sounding new? Yes and no. Rock n roll's great idiot savant, Elvis Presley, married blues to country, creating the 20th century's most popular form of music. And while his first single at Sun Studios, a breath-taking version of Arthur ”Big Boy” Crudup's ”That's All Right Mama,” doesn't sound anything like the sluggish original it is still properly credited to the rightful author. Same goes for all three of the Beatles covers of Carl Perkins songs. Taking a stray riff is one thing. Appropriating an entire song's music and lyrics while listing yourself as the author is quite another. In the summer of 2000, two Yardbirds CD's from the Jimmy Page era were released. The first release was a limited edition of the famed Live Yardbirds Featuring Jimmy Page issued by Mooreland Street Records. Contrary to rumors, Jim McCarty and Chris Dreja are quite content with the quality of the show as is Keith Relf's family. Page had this album surpressed twice before in the '70's. The CD's sold out quickly. Apparently Mooreland Street Records had dealings with Page's represenatives. Russ Garrett, head of the company, also runs a Yardbirds fan forum on the internet. He has alluded to legal scuffling with "800-pound gorillas in buisness suits" on the website. Garrett would not respond to repeated requests for an interview. The other Yardbirds release was issued by New Millenium. It contained the legendary final studio sessions from New York City in April 1968. Called Cumular Limit, the CD had fans salivating. This was especially true, because McCarty hinted in a interview from the spring of 2000, that a take on "Tangerine” would be included. The Yardbirds version was called "Knowing That I'm Losing You." However, that track does not appear on the new release. "I was advised that one of the members wasn't exactly delirious with the album,” Carlton Sandercock at New Millenium said. Considering that Keith Relf was tragically electrocuted in 1976 and that both McCarty and Dreja participated in the CD's liner notes, it doesn't take much detective work to figure out which member is unhappy with the release. Asked what happened to the inclusion of "Knowing That I'm Losing You" on the CD, Sandercock would not go into details. "Unfortunately, one of the songs was not released,” he simply said. "Knowing That I'm Losing You" appeared on at least one file-sharing internet site in the winter of 2007. A Google search might turn it up for the avid web detective. Cumular Limit also has a live version of "Dazed and Confused” from French television in the spring of '68. For once, the song is credited properly, reading "Jake Holmes; arr. Yardbirds." It came as no surprise that the CD was surpressed within a short time of its release and is no longer available except as a Japanese pirate. A video of the Yardbirds on the French television show crop up regularly on YouTube. And for those who still think the Yardbirds called their version of the song, "I'm Confused," take note how the French MC introduces it as "Dazed & Confused," laying that myth to rest for once and all. The tangled web that is "Dazed & Confused" was unsnarled to a degree in 2004 when Jake Holmes' LP saw the light of day in the digital age. The Above Ground Sound Of Jake Holmes appeared on CD in America on the itsaboutmusic.com label and on Radioactive in the UK. His original version of "Dazed & Confused" is finally garnering some of the attention it was always due, with mainstrem rags like Mojo showcasing its parent album. For folks who have yet to hear the original, visit: www.myspace.com/jakeholmes and feast your ears! As for the man himself, Jake Holmes is looking for a lawyer who will not be cowed by the Page's fearsome business and legal reputation. This author - with tongue firmly in cheek - suggested forcing the issue with Holmes recording a Led Zeppelin staple like "Kashmir" and taking credit for it. Holmes only laughed. He has learned to view this chapter in his life with a sense of humor and take it with a grain of salt. This investigative piece may appear to be gratutious Page-bashing, but rest assured it's far from it. To this day, Jimmy Page is unacknowledged as one of the, if not the greatest psychedelic guitar players ever. Page's criminially underrated work with the Yardbirds and on countless sessions (take note of his hypnotic work with Donovan in particular) illustrate that he set the standard for lysgeric discord par excellence. And in light of the fact that Page played on hundreds of uncredited session tracks in Britain between 1963 and 1966, and was instrumental in the Yardbirds and Led Zeppelin, he is probably the most recorded major rock guitarist ever. His fretwork itself is unassailable. Even on the lightweight session material he appears on, Page's guitar playing is impeccable, which is amazing if you consider that the majority of those forgotten groups should not have been within earshot of a studio. In the end, though, it is his habit for taking credit for other's people's material that is being examined here, not his guitar sorcery. Thanks to Greg Russo and Mike Fornatale for providing valuable insight and information. This piece originally appeared in Perfect Sound Forever in 2001. Certain sections have been added and updated from stories Will Shade wrote for both Ugly Things and Shindig magazines subsequent to this piece's original debut.